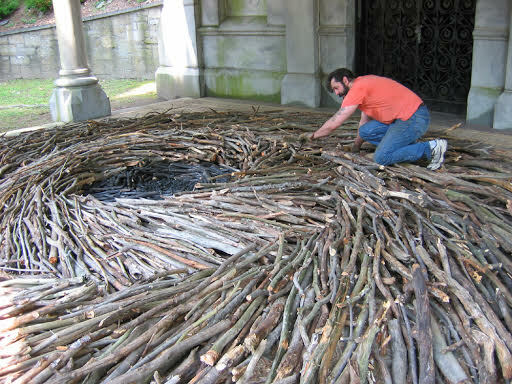 Together with the Arlington Commission on Arts & Culture and Arlington Public Art, 13FOREST Gallery is pleased to present Outside|In, a series of artist talks about public art along the Minuteman Bikeway. The Minuteman Bikeway has been a vital thoroughfare for commuters and those seeking recreation for the past 25 years. Passing through the historic area where the American Revolution began, the Minuteman Bikeway now unites the towns of Cambridge, Arlington, Lexington, and Bedford, and is one of the most popular and successful rail trails in the United States. To commemorate the Minuteman Bikeway's 25th anniversary, a series of public art projects are being installed along the beloved path. Collectively known as Pathways, these installations inspire conversation and appreciation for a treasured local resource which runs just a few blocks from the gallery. 13FOREST Gallery is happy to further these conversations by hosting talks with the artists behind these works. Join us this summer and fall to learn more about public art and the important role it plays in our community. Pathways is supported in part by a grant from the Arlington Cultural Council, a local agency funded by the Massachusetts Cultural Council, a state agency. The Rhetoric of Opposites is supported in part by a donation from SunBug Solar. The installations can be found between Linwood Circle and Swan Place, near the Kickstand Cafe. Sat 10/21/17, 4-6 pm: Ripple, Adria Arch and the Arlington Knitting Brigade and Current, Frank Vasello. Event details here. 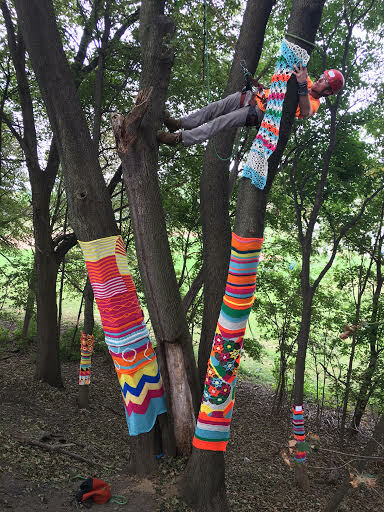 Created by Adria Arch and the 57 volunteers of the Arlington Knitting Brigade, Ripple celebrates art, nature and community. Brigade members knitted and crocheted unique panels using a shared palette developed by Arch. Wrapped around tree trunks, their work has transformed a small grove of Norway maples into a magical place of the imagination -- filled with vibrant color, varied patterns, and rich textures. Current is a site-specific sculpture for the Minuteman Bikeway that is constructed entirely from natural materials gathered along the Bikeway. The sculpture responds to the unique location and terrain along the bike path, giving new life to the dead and cast-off materials it is comprised of. Vasello's work is often concerned with death and the cycle of rebirth as well as mythology. Artist Skunk is the Fleet Admiral of SCUL, a sci-fi fueled bicycle chopper gang. SCUL members create fantastic bicycles, known as ships, which they use to complete patrol missions around Boston. Skunk's ship, Cloudbuster, is the flagship of the SCUL fleet, and is "somewhere between an elephant, a garbage truck, and a rift in spacetime." In both Eastern and Western thought, the butterfly represents transformation, freedom, joy, and the power of change. The butterflies of Flutter are formed in a contemporary material, translucent Plexiglas; perched on a chain link fence they negotiate the boundaries between the urban and natural worlds meeting at the Bikeway. The Rhetoric of Opposites juxtaposes words with opposite meanings in pairs along the Bikeway. By bringing these polarizing words into the public realm, Moochhala invites bikeway users to think about where they come from and where they are going, and how words can divide us or bring us together. Join 13FOREST Gallery on Saturday June 3 for Arlington's second annual Porchfest! We are excited to open our gallery to another group of talented musicians this year. Porchfest is a community music festival featuring local musicians performing throughout the neighborhood. Stop by the gallery from 2 to 6 pm on Saturday for live music, refreshments, and of course some great art! 2-3 pm: John Mark, Americana, blues, country, folk. 3-4 pm: Nate Taylor, folk, fingerpicking. 4-6 pm: Linda Marks and Terry Smith, jazz, pop, folk.